Susan Thompson Jackson, 93, life-long resident of Mount Olive, passed away Sunday evening, April 7, at Genesis Care Center. Funeral services will be Wednesday, April 10, at 6:30 p.m. at Tyndall Funeral Home, officiated by her grandson, Pastor Bobby Smith, and Pastor. Richard Cuddington, with visitation to follow. Committal and interment will be Thursday, April 11, at 11 a.m. at Wayne Memorial Park. In lieu of flowers, memorial gifts may be made to Northeast Church, 489 Northeast Church Road, Mount Olive, NC 28365. Mrs. Jackson had served as office clerk at Belk-Tyler’s in Mount Olive for many years. 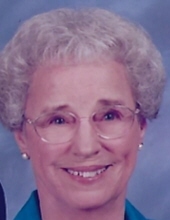 She was a member of Northeast Original Free Will Baptist Church and its ladies auxiliary. She was preceded in death by her husband, Grover Jackson; a son, Elton Willard Howell, Jr.; her parents, C. W. and Katie Thornton Thompson; a sister, Sarah T. Letchworth; and brothers, Bill Thompson and C. W. Thompson, Jr. Survivors include three daughters, Linda C. Howell of Dudley, Betty Jo Best of Mount Olive, and Cathy Waller and husband, Dennis, of Mount Olive; step-daughters, Joyce Marie Grant of Colorado, Betty Lee Anderson of Goldsboro, and Sherry French of Grantham; grandchildren, Angie Waller and husband, Bob Toney, Denise Mason and husband, Lee, Keith Waller and wife, Ginger, Pastor Bobby Smith and wife, Carolyn, Joy Reid, Rita Ann Noguess, Norman H. Millen and wife, Bridget; great-grandchildren, Rev. Robert L. Smith, III and wife Kelly, Susan Lane and husband, Josh, Lydia Smith, Reagan Waller, Hayden Waller, Cody Blake Millen, Spencer Millen, Allen Alphin, Justin Alphin, Rebecca Noguess, Jamie Noguess, Jr., and Elizabeth “Lizzy” Noguess; five great-grandchildren, Thomas Lanier, Abby, Julie, Aiden, and Allie Ray Alphin; five step-grandchildren; and many step-great-grandchildren. She is also survived by her loving sisters, Nellie T. Anderson of Mount Olive, who was also her Genesis roommate, Mary Ann Holliday of Cary, and Peggy Percy and husband, Al, of Cary. To send flowers or a remembrance gift to the family of Susan Thompson Jackson, please visit our Tribute Store. "Email Address" would like to share the life celebration of Susan Thompson Jackson. Click on the "link" to go to share a favorite memory or leave a condolence message for the family.